Museum Speelklok (Speelklok = musical clock) is a museum in Utrecht with a collection of automatically playing musical instruments, of which most are still working and therefore you can hear there music. There are music boxes, pianolas, barrel organs and a turret clock with carillon. The museum’s restoration workshops are considered to be leading their field. The word “speelklok” is defined as a musical clock. This museum collects, preserves, displays and restores an enormous and globally recognized array of self-playing mechanical musical instruments. One of the Museum Speelklok’s major roles lies in disseminating its knowledge of the collection to a wider audience. Also, its restoration workshops are a leader in their field and are well-known for their first-rate standards. In the summer of 1956, the Museum Speelklok originated in an exhibition of mechanical organs and other musical automata in Utrecht. This exhibition was entitled “From Musical Box to Street Organ”. Its success led to the establishment of a permanent national museum devoted to mechanical musical instruments. The museum welcomed the public in 1958, when its home was still in the wing of what is at the moment St Catherine’s Convent, in the Lange Nieuwstraat in Utrecht. Queen Beatrix officially opened the museum’s current housing in the central medieval Buurkerk in 1984. In commemoration of its 50 year Jubilee in 2006, the Museum Speelklok hosted an extraordinary exhibition, “Royal Music Machines”. In this special event, a range of renowned museums, such as the Louvre, The Hermitage Museum, The Kunsthistorisches Museum in Vienna, and the Metropolitan Museum of Art in New York loaned one-of-a-kind instruments. 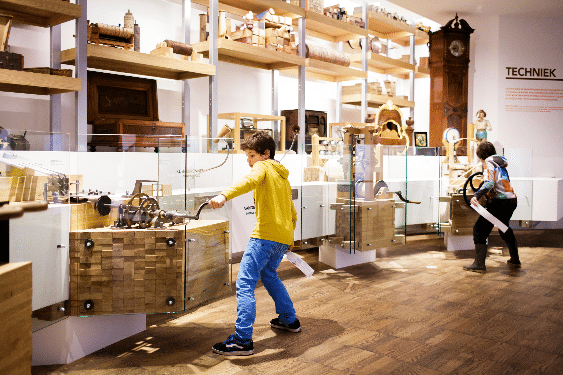 The Museum Speelklok offers its visitors fun and memorable sights and experiences. Whether you are an adult who have fondness on musical instruments or a child with growing love for music, this place is ideal for you. Guided tours begins each hour and the tour guides is not only limited to playing the musical instruments live. Also, they share some of the bizarre and startling stories behind the pieces in the collection which are very interesting and even suitable for children. For foreign visitors, English tours are conducted by request free of charge. If you want to see mechanical magic and other stimulating learning, you should not fail to see the different exhibitions here. In this museum, you will see the works that are influenced by a famous clock maker, automation and illusionist, Eugène Robert-Houdin. Other insightful collections are also available for visitors to explore and discover. This is the place where children are having a lot of fun. In the Music Factory, they can work on composing, programming and playing their personal musical box music. Children with ages 4 to 12 years old will receive a free plingplong car upon their arrival at the ticket desk. Staring on May 15, 2009, museum visitors are allowed to witness the restoration of the Chinese Imperial Musical Clocks and other instruments. This is the very first time that the general public got the chance to see restoration work in progress since the Museum ‘From Musical Clock to Street Organ’ was established. Visitors can take some refreshments and homemade carrot cake to the accompaniment of live music played by the instruments at the Museumcafé Klok. If you want to play the music of your interest, you can just insert a coin to let the instruments starts playing. No visitor should look further if he or she wants to find a unique and special musical gift. The museum shop sells a broad assortment of articles and all kinds of excellent gifts for children and anyone. CDs, DVDs, books, music games, musical boxes, musical toys, postcards and more are available. The museum is at the very heart of Steenweg. Its venue is inside Buurkerk, or the citizen’s church which is found at the city centre. This is a short walk from the Utrecht Central Station. You can take a city bus 2 and get off at Domplein. If you are riding a car, the parking should be at Springweg and Hoog Catharijne.